John Challis set off for two months in Malawi this week. While he is there he intends to complete the refurbishment of the Clinic and staff houses at Mlowe which will include replacing electrical fittings and installing electricity in the units which do not have electricity at present. He will also reinstate the water supply from an old bore hole, installing a new pump so that all parts of the complex, including the staff houses, have an adequate water supply. He also hopes to install a power supply for the radio transmitter and reinstate the system. Good luck with the list, John and God Bless. A big thank you to all our volunteers who turned out on a very cold windy day to load FCL 74 EKW. For almost the first time, the container was late arriving because strong winds had closed the Erskine Bridge to high sided vehicles. 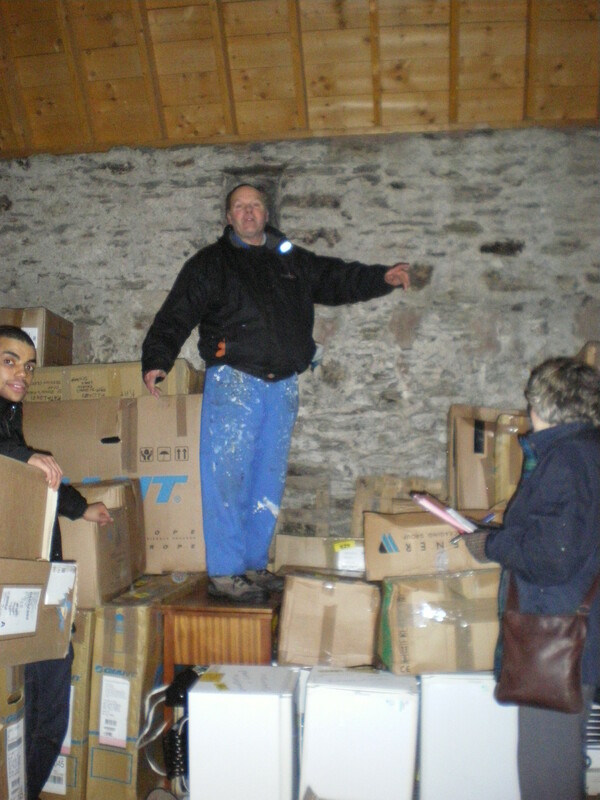 Despite of snow and hail showers the container was loaded with 1078 assorted boxes, bags and parcels. 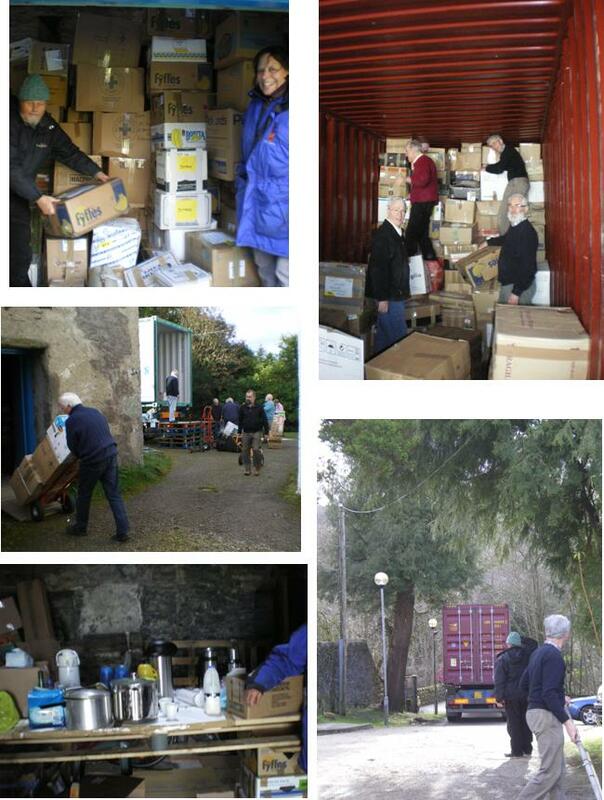 Thank you to the “shed team” who load the trolleys, the “trolley dollies” who move trolley loads of boxes to the container, the “loaders” who load the boxes into the container and the “packers” and last, but but by no means least, the catering team who supply us with hot tea and coffee, soup and filled rolls and keep us all going. Thanks to all of you, FCL 74 EKW was waved off down the road on the first leg of her journey to our friends in Malawi with a prayer and a blessing. Peter and Tina say a big thank you to the Raven Trust. Raven Trust’s co-workers, Peter and Tina, have been living and sharing God’s love and compassion in Central Asia and the Arab world since 1999. Their work began with involvement in income generation programmes for refugees. This was followed by teaching English and computing in poor regions. This enabled many of their students to secure further training at university and gain employment which has helped to lift them out of poverty. In addition, Peter and Tina have provided cross-cultural awareness training addressing the many wrong presuppositions, misconceptions and misunderstandings between East and West. Hearts and minds have changed as a direct result of this training. People who once had hatred for everything western have adopted a friendlier attitude. Hostility has given way to a desire for peace. Given this success, Peter and Tina have expanded the work by recently establishing their own English language and cross-cultural and ethical awareness centre. They will also be involved in producing literature and educational resources to equip other trainers throughout their region. Peter and Tina’s work is mostly voluntary. In addition to prayer, the Raven Trust gives practical support by providing accommodation, transport, clothes, and other necessities while Peter and Tina are on home leave in the UK. Should you wish to support Peter and Tina, please get in touch with the Raven Trust for details.